labs: Using Google Docs to track your $. . . | andrewANDORU. . . I am absolutely terrible at keeping track of my spending, I really didn’t have a simple and quick method. Now, however, I have discovered an incredibly user friendly and efficient way of doing just that, all using Google Docs, so it will always be available from anywhere with Internet access. Google makes it EVEN cooler with access to all these things Offline as well meaning as long as the info has been recently synced up, you can check your balance spreadsheet, email, etc. without an internet connection, using Google Gears. I followed a Doc written up by Nick Espinosa, that allows be to access the Form to Add a Transaction or Deposit in many different ways, the main one being right from my email Account, other include a simple bookmark, etc. You could even do this with an Internet capable phone (iPhone, I wouldn’t recommend the others). So basically whenever you spend some $, you simply open up the form, fill out the info, press Add and the data will be sent to your Google Docs Spending Report spreadsheet, which you can also access easily from Gmail, or just a simple Bookmark, to checkout your total Balance, or really do what ever you want with it. You could even make Pie charts of the different categories of your spending, or a line graph to watch how the amount of money you have is falling drastically. . . Anyway, it is fantastic, I highly recommend trying it out. And for those not using Gmail already, come on already, it is not that tough to switch your email address, and it is definitely worth it. Also I can email anyone the link the the Google Docs template from my own account so they can use it as reference as well. 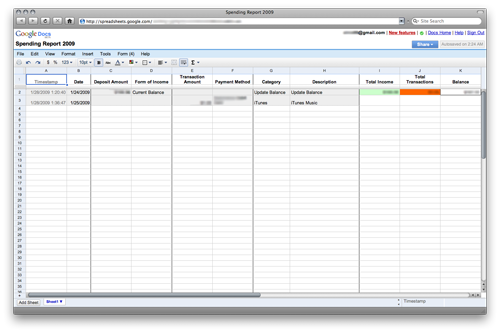 The part that will take the longest is creating your own custom form that you will use to add data to your spreadsheet. So worth the 10 minutes it took.